‘If you don’t like it – go home’. 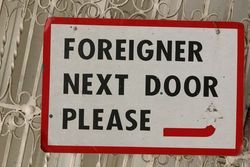 This is how I constantly phrase my feelings towards those foreigners in Japan who partake of never-ending Japan bashing. Whether it is bureaucracy, straightjacket customs and formalities, reluctance to change, odd food, unusual approaches to relationships, Japan bashers have a constant source of ‘us and them’ complaints. The first time I lived here, I couldn’t get far enough away from those people. I watched as homesickness, insecurities, struggles with the language, laziness, and latent racism, descended into group therapy slanging sessions. The need to vent in an unfamiliar setting is natural, but only if it tempers an otherwise respectful attitude towards the host country in question. I found the lack of such respect frightening and sickening – whining in English loudly in a restaurant about ‘them’ (because of course ‘they’ couldn’t even understand this patronising tone of voice and offensive use of body language), doing things on purpose on public transport because it was bad behaviour, gradually taking Japanese-ness to be a catch-all explanation for every unwanted situation encountered. I realised that I was watching a kind of DIY live feed on how to build the basis of lifelong racist prejudices. If it is as simple as ‘if you don’t like it – go home’ then why don’t people like this leave? The problem, I find, is that even the most ardent abuser of Japan can be captured, enamoured even, by a certain aspect of life in Japan. This foreign breed thus becomes embroiled in something worse than culture shock infused racism: it is self-reflection shock. Self-reflection shock results from a) realising that life in Japan is strikingly unique, vastly different to life in country of origin, and potentially far, far more fulfilling and b) coming to a sub-conscious conclusion that as life is unique, and as the Japanese guard it exclusively, the foreigner will never be able to fully share in it – no matter how hard they try. Once one has realised the futility in trying to assimilate and integrate into a culture otherwise enthralling and endearing, and is constantly reminded of one’s own difference and anomalousness, the cutting, biting, find-the-worst-in-everything foreigner bursts forth. This process happens very quickly. Happily I thought that I had avoided self-reflection shock by treading a very narrow path of integrating to the point where friends told me I was more Japanese than they were, and then amusing them by exaggerating the English parts of me that I knew they admired, enjoyed, and which fitted in. In a nutshell I was one or the other on a whim – and knew I was acting both… But. I went home, and came back. And when I returned to Japan I was not surrounded by the same people who think I am, and who make me think I am, more Japanese than a Japanese person. Instead, I felt it my duty to mentor some of the foreigner Japan novices around me. I began to use expressions like ‘it’s always like that in Japan’, and ‘that’s just the Japanese way’, or ‘that’s such a Japanese thing to say/ do/ think’. Using expressions in a way that implies I have insider knowledge and some sort of authority on an entire country, while having hardly any time to immerse fully in Tokyo life meant that I had actually descended into something as bad as Japan bashing. I was a jaded Japanophile- someone who avoided self-reflection shock so well that they convinced themself, with a self-satisfied air, that their cultural analysis and amateur psychoanalysis of a whole population must be correct. I was pulled straight out of this smug bubble last weekend when I visited Tohoku (the tsunami devastated region in the north of Japan), with a charity group of Tokyoites, crucially Japanese Tokyoites (not a foreigner in sight). Devoid of other people either to advise on the idiosyncrasies of Japanese-ness, or to silently reproach and reprove, I was spoilt with the kind of company that had originally allowed me to avoid the pitfalls of culture clash. I was immediately seized with guilt. In being thrown into life in Tokyo, assuming that it would be the same as my two years in rural Japan I forgot to qualify my moments of cultural exhaustion with a strong dose of self-awareness and realism. The time I spent in Tohoku was brief, and I hope I can go again soon. Yet meeting and speaking to people who have been through such catastrophe was enough to serve me a timely slice of humble pie.